A place hardly anyone knows. They barely bluff a cow. The cabin is home to a packrat now. Called from his condo one day. Receive a few cows, and take along some hay? So Loyd and I jumped at the chance. We were only going for one dance. We let one dance lead to more. Swept out the cabin and fastened the door. And named a few of the cows. And neighbor's steers starve baby calves. But the owner has no clue. With so much left to do. What a strange personality quirk. There's no such thing as just "daywork." Cycles of life that order my days. With baby calves and brand-new hope. The usefulness of nylon rope. Of folks who love the land. They're all part of a whole. Of a life that is part of my soul. Birds twittering at first light. A familiar trail on a moonlit night. A fresh clean wind across the range. Thank God for things that never change. Audrey Hankins has lived the life of which she writes. 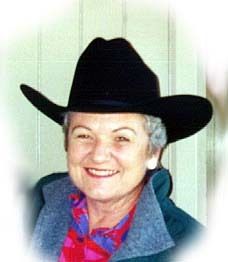 She takes pride in being a real ranch wife.